Typhoon No. 15, Marie, which had blown through Honshū, was in the Sea of Japan at 12:00 on September 26, 1954, proceeding Northeast at a speed of more than 100 kilometers an hour. It was predicted to reach the Tsugaru Strait at around 17:00. At 11:00, the Tōya Maru arrived at Hakodate after its first journey that day from Aomori. She was originally scheduled to return at 14:40, to arrive at Aomori just before Typhoon Marie. However, due to the expected storm, another ferry—the Dai 11 Seikan Maru, a somewhat poorer quality vessel—could not depart on its scheduled journey to Hakodate. Therefore, passengers and vehicles were transferred to the Tōya Maru delaying departure. The captain of the Tōya Maru decided to cancel its journey at 15:10. At 17:00, following heavy rainfall in Hakodate, the weather cleared up and the outlook improved. The captain presuming that the typhoon had now passed as predicted decided to proceed with the journey for Aomori. However, by this time the typhoon had slowed and was predicted to stay over the strait for an entire day. At 18:39, the Tōya Maru departed from Hakodate with approximately 1,300 passengers aboard. Shortly thereafter, the wind picked up coming from a SSE direction. At 19:01, the Tōya Maru lowered its anchor at the very side of Hakodate Port to wait for the weather to clear up again. However, due to the high winds, the anchor did not hold and Toya Maru was cast adrift. Water entered to the engine room due to poor design of the vehicle decks, causing its steam engine to stop and the Tōya Maru to become uncontrollable. The captain decided to beach the sea liner onto Nanae Beach, on the outskirts of Hakodate. 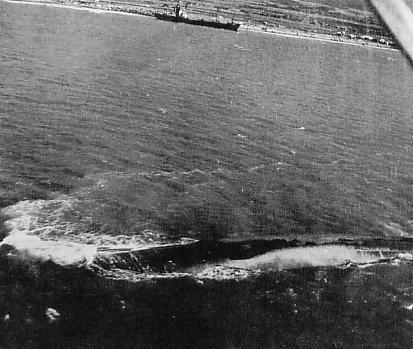 At 22:26, the Tōya Maru beached and an SOS call was made. However the waves were so strong that the sea liner could no longer remain upright and at around 22:43, the Tōya Maru capsized and sank at sea several hundred meters off the shore of Hakodate. Of the 1,309 onboard, only 150 people survived, while 1,159 (1,041 passengers, 73 crew and 41 others) died. The captain decided to beach the sea liner onto Nanae Beach, in the outskirts of Hakodate City. At 22:26 hours, the Toya Maru beached and an SOS call was made. However the waves were so strong that the sea liner could no longer remain upright and at around 22:43 hours, the Toya Maru capsized and sank at sea several hundred meters off the shore of Hakodate. Of the 1,309 on board only 150 people survived, while 1,159 (1,041 passengers, 73 crew and 41 others) died. Four other ferries sank in the same typhoon with a total loss of life of 1,430.